Each of the Crowne Pointe Historic Inn’s 40 recently renovated (2000) guestrooms and luxury suites are distinct in size and shape. Classic colors and Victorian appointments provide an air of Old World charm. All rooms are equipped with private baths, showers, complimentary wired and wireless high-speed Internet, CD players, television and VCR, coffeemaker and refrigerator. 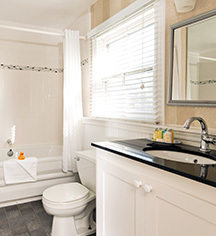 The "Pamper Me Once" heritage accommodations include a queen sized bed and private bath with a shower. 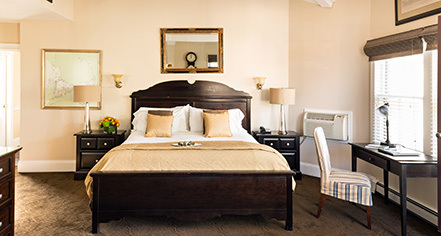 All guestrooms also feature a television with a VCR (and unlimited use of the inn's video library), a CD player, ice buckets, glasses, full closet with mirror, comfortable chairs and reading lamps as well as a coffee maker and refrigerator. These rooms are bright and airy and all feature private access from the main house two story wrap around porch. The "Pamper Me Twice" accommodations include all of the amenities mentioned above and also feature an expanded amenity such as a king-sized bed, private deck, a fireplace or a whirlpool tub. Many of these rooms feature views of the spectacular victory gardens, and many open onto spacious sundeck areas and onto private porches. The generous "Pamper Me Three Times" rooms include all of the previously detailed amenities as well as at least two expanded options--for example, both a fireplace and whirlpool tub, or a king bed and outdoor deck. Relax in peaceful privacy and soothing ambiance. For a perfect romantic escape or honeymoon in a historic place, the luxury, elegance and warmth of the Junior Suite bedrooms are an inviting option. Spacious fireplaces and cushy seating areas are just a few of the amenities that await. The magnificent Executive Suite accommodations are bright, and luxurious and feature a kitchen area, dining area and comfortable seating areas to relax, unwind, conduct business or share a fine bottle of wine with friends. The suites also feature outdoor areas where for dining, reading or enjoying the ocean air.